So far it would seem that the summer sales which started this month has got the better of some people’s frugal plans. “I cannot see any difference from the first few days of last year’s summer sales,” said Marcela Ibars who has worked at cosmetics store Douglas in Torremolinos for 10 years told EWN. 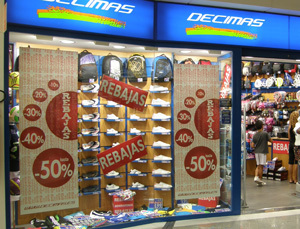 “There must be at least 50 per cent more people than there are when there are no sales,” said Estefania Martins, 25, who has worked at sports shop Decimas for a year.